Home Off Beat	Flag Tattoo: Wear your patriotism! 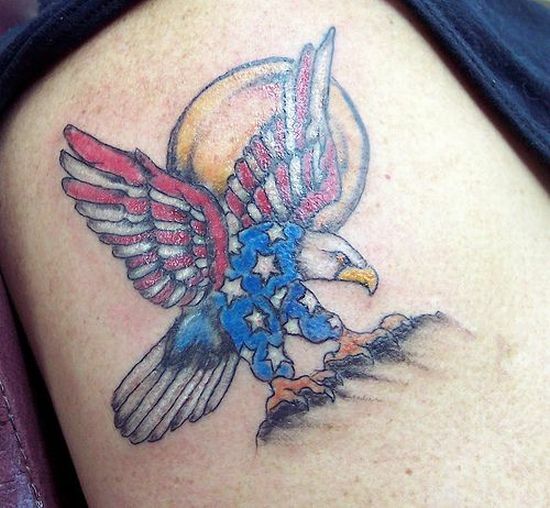 Flag Tattoo: Wear your patriotism! So you love your country, do you? Does that mean youâve got to join the military and fight at the front line? Not always! We all feel extreme love for our countries and we can wear our patriotic sentiments with pride by getting the national flag inked on our body. Flag tattoo is the best way to show your love for tattoos and your country. Pinned below are some amazing and really unique flag tattoos and I bet each tattoo, inked in different styles, will make you fall in love with your country and tats too! Scared-stiff: Skull and snake tattoo! What does your tattoo say! Tattoo that mowed his head off! Hello kitty skeleton tattoo-Neither cute nor scary…. Can Modeling and tattoo go together? Queen of hearts tattoo-Love for cards! Angel tattoo: Calm, pure & beautiful! Music is in the air! Owl-Skull Tattoo: Scary, is it? ‘Hurt like hell’: Rihanna’s tribal tattoo! Geeky Mario tattoo : Colorful and cute! For a natural look at all times! Spiderweb tattoo – Beware ! Tattooed head: Eyes on my back!